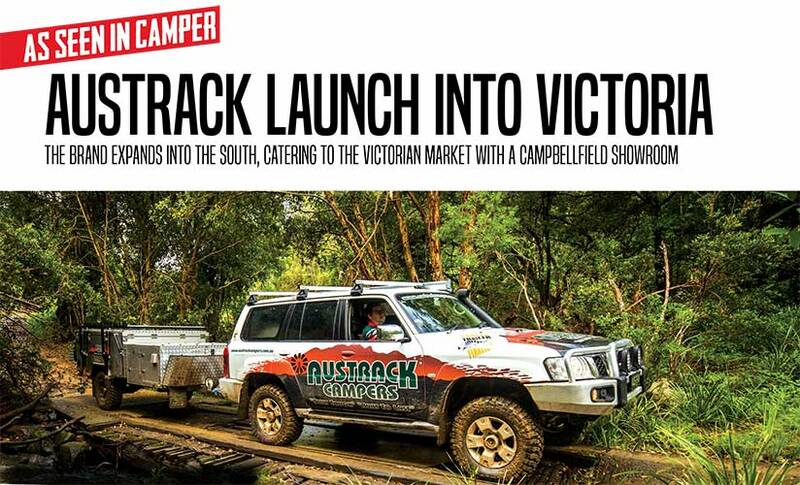 Read Camper Trailer's review of our award winning Simpson X Camper Trailer. Exciting news!!! Our Melbourne showroom is now open. "BUILT TOUGH, BUILT TO LAST"
Our NEW Melbourne showroom is NOW OPEN! Come in and see our range of Quality campers at 65 Merola Way, Campbellfield. 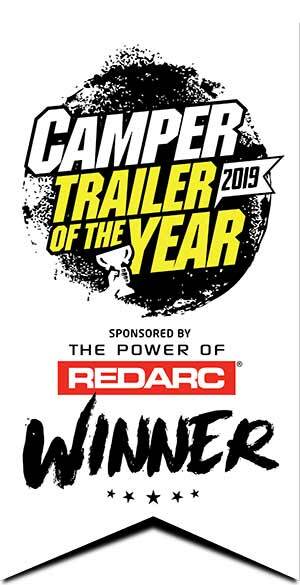 Austrack Campers are proud winners of Camper Trailer of the Year 2019 with our Simpson X check it out here! 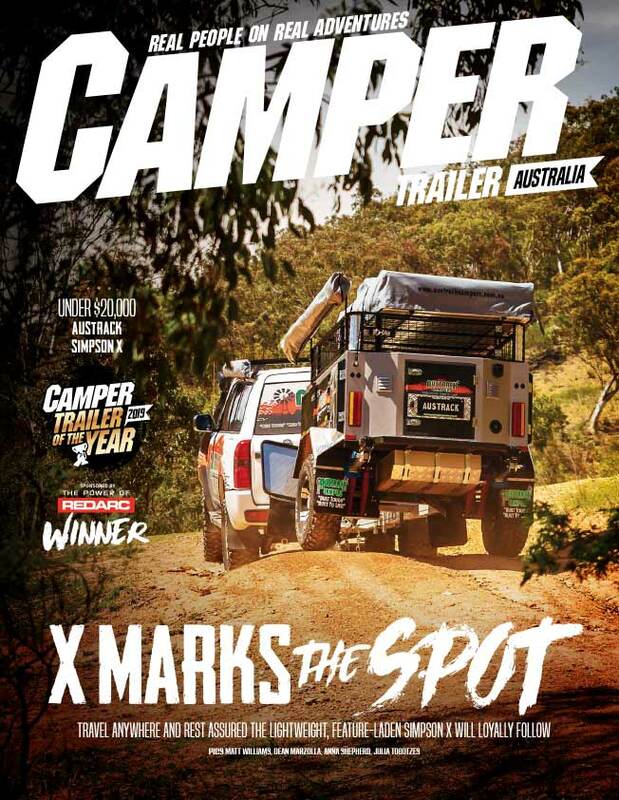 Camper Trailer Australia have reviewed our latest 2019 version of the mighty TELEGRAPH X – check it out here! 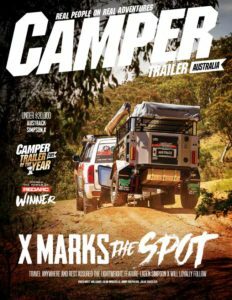 Camper Trailer Australia put our TELEGRAPH X through it’s paces on Bribie Island as part of our being selected as finalists in the 2017 Camper Trailer of the Year. They loved it! Have a look and see why..
One of the best things about living in Australia is its wide open spaces. 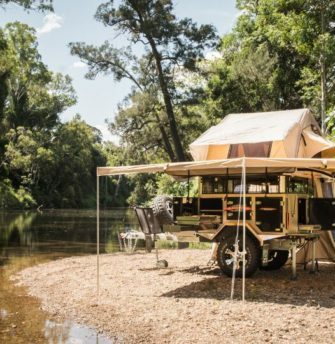 One of the best ways to get back to nature and enjoy all this great country has to offer is camping, and what better way than a Camper Trailer. Whether it’s a peaceful mountain creek or near the roaring waves there’s a camping experience to suit everyone. 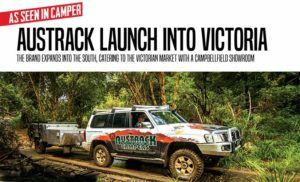 At Austrack Campers, we love the great outdoors and aside from having the best Camper Trailers and Tents available on the market, we also have a ton of great tips on where to go and how to get the best out of your equipment. We’ve got a camping solution to fit every age and experience. Our flagship hard floor front or rear fold camper trailers are self-contained and are the quickest and easiest to set up with full off road capabilities. 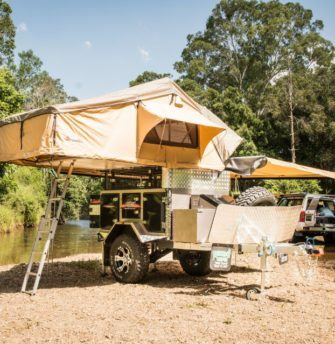 The Extreme and Off Road camper trailers are for the larger families who love the true camping experience, packing a huge soft floor tent that is made from the highest quality components that will withstand anything you can throw at them. We pride ourselves on sourcing the best quality materials to make your camper trailer. Austrack Campers don’t settle for second best – we figure if you’re going to do something, do it right. Having been building camper trailers for over 12 years and listening to our customers we are always developing new ways to make our products even better and are the forerunners of innovation in the camping industry. That’s why we say our trailers and tents are “Built Tough, Built to Last”. Come and have a look for yourself at our Caboolture showroom at 73 Lear Jet Drive. If you can’t get there, we’ll be coming to a place near you soon at one of the Camping Expos throughout the year. Check out our 360° virtual tour of our showroom! Needed to let you know that you have a fantastic product. It is perfect for weekend trips to the dams around SE Queensland. So fast to put up, I am in the water before others even setup. Our original tent has now been retired. (never going back to putting that up!) We get people come up and ask us about the tent all the time. Our record is about 20 people in a day!!!! People are fascinated by it. The tent sits perfectly on top of our jet ski trailer, it tows fine. My husband and i bought a roof top tent from Austrack Campers in 2010 and the only trouble we have had with it was a broken zipper on the main cover( which they fixed the day we went back to the store with no charge)…We have spent many comfortable nights camping in the outback and there is more than ample room inside… The main reason for this letter is to tell you about our trip to Adelaide. My husband and I always wanted to stay on the Hay Plain for a night so we had our opportunity when my nephew was getting married. It was just after 11pm on the 10/11/11. We were driving along the Hay Plain and drove into some really heavy rain and lightning. When the rain eased we quickly pulled the tent out and jumped inside. There were warnings about very high winds and we were in the middle of it, our 4×4 rocked so much I thought it was going to tip over, I have never been so scared and if it wasn’t for your tent I probably would have freaked out. I have never in my life seen a tent that can handle 70-80km winds but yours didn’t give an inch. We have always recommended your roof top tents but now we can’t praise them enough. Thankyou for making such a strong comfortable tent and we look forward to trying it out next year when we head to Cape York. We just wanted to thank you for your great customer service. 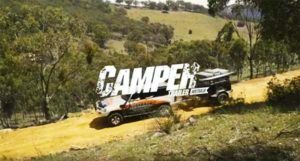 We purchased a Roof Top Tent from you in September 2011 and it was tremendous on our 4×4 driving holiday in the Victorian High Country, even keeping out the high country weather. Just a note to let you know how happy we are with your Austrack Camper Tent. I’ve mounted the tent on the trailer using the gas struts and it works a treat. The tent was a straight forward assembly and dismantle much easier than I anticipated, in fact it was done in no time with my daughter who’s 10 yrs old and myself. The quality of the product is exceptional and superior to most products that are on the market today.The whole process from initial correspondence with your good self and finally to the ordering process was professional, honest and timely. Thanks to you and Tanya for all your help and advice, I will be recommending you and your company to anyone in the market after a Camper Trailer. I can’t wait to show it off! Thanks again for having our camper turned around so quickly. We have had some fantastic trips already in it. (pic attached) We love it….and so do many other people. We get people coming up to us all the time wanting to have a look or just comment on what a great camper we have. Modifications I have done DIY style with the help of tradies. Kitchen 12 volt system with deep cycle battery, powering permanently and removable LED light strips. I love it! We arrived home at 1pm, all ok. Drove through some heavy rain for about 3 hours (camper perfectly dry). The trailer as you know is a dream to tow, can’t wait to set up the tent. Thankyou once again for this superb camper. We got our camper tent yesterday erected it today we are very happy with your product and quick service and will recommend you guys to everyone cheers. Just some feedback on our rooftop tent. Love the product, have had no problems in the 12 months we have had it and it’s travelled across the country with us and our 3 dogs. Easy to set up, comfortable, and heaps of room. Ours is mounted on a custom made trailer as we are keen trail bike riders. We have also mounted the vehicle awning on the trailer. Just a quick note to thank for your excellent service – I am impressed. The tent arrived yesterday afternoon in good condition, and on initial inspection we’re very happy with the quality. Hello, here we are on holiday with our new Austrack camper trailer in the Swiss mountains. We love the space in side the camper and the kingsize bed. This is something what can’t be found in the European trailers. Kind regards.